Wolves were nearly eliminated from Western Europe (except for Italy and Spain) by 1950. The last Japanese wolf was shot in 1905. The world’s present population of gray wolves is estimated to be about 200,000 in 57 countries. 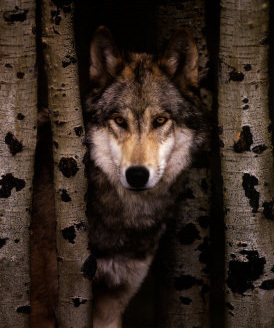 Of those 57, less than half provide the gray wolf with any kind of protection against hunters. The North American continent has the largest number of wolves with 11,000 in the United States and about 60,000 in Canada. The reason Canada has so many is due to that fact that much of its 3.5 million square miles is so sparsely populated, allowing wolves to run free in their natural habitat. Since the 1970s wolves have been protected under the Endangered Species Act in the lower United States. Unfortunately Alaska and Canada don’t protect their wolves and thousands of wolves are killed a year (there are a few minor regulations though). As far as wolves in other parts of the world, scientists have not documented a sighting of a wild wolf in Mexico since the 1970s, but the Mexican government has pledged to work with the U.S. in reintroducing wolves along the border. Russia, including Siberia, has around 40,000 wolves spread across 12 time zones and 6.5 million square miles. The largest western European wolf population is in Spain. They only have around 2,000 wolves, yet they still don’t have protection for them. Truth is Spain considers the wolves to be “game animals.” That means it’s legal to hunt them during hunting season, like deer. Italy protects the 400-500 wolves in its borders, and thanks to that the wolf population is increasing. Latvia has around 900 wolves, but the laws permit 400 to be killed a year. Poland also protects their wolves, and has a growing wolf population that’s currently around 800. Portugal tries to protect their wolves, but illegal hunting continues to keep the wolf population low. In the Middle East, Israel has protected its wolves since 1954 and is building a stable population of around 200. Iran has a steady population of around 1,000. In Asia, only China and India protects wolves. India has around 1,300 but the numbers are going down due to loss of habitat. China has around 6,000 wolves. Although Mongolia may have as many as 30,000 wolves, the government doesn’t protect them and their numbers are dropping. There are very very few wolves in Egypt and Jordan, and the little that remains are quickly dying out.